Cavalrymen fought for control of the center of Vilnius and took Cathedral Square, the castle complex on the hillside, and the enemy quarters on the southern riverbank. 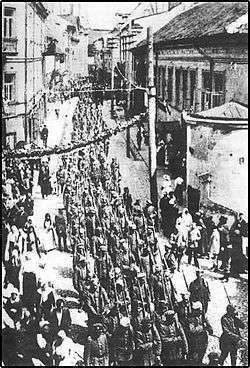 They also captured hundreds of Bolshevik soldiers and officials, but their numbers were too small compared to the enemy forces, who had begun to reorganize, particularly in the north and west of the town, and prepare a counterattack. Belina sent a message reporting that "enemy is resisting with extreme strength" and asking for immediate reinforcements. At around 8:00 in the evening the train he had sent in the morning returned with the first infantry reinforcements. The Polish troops were also supported by the city's predominantly Polish population which formed a militia to aid them. By the evening of 19 April half of Vilnius was under Polish control, however, the Red Army troops and supporters were putting up a stubborn and coordinated defence. Only upon the arrival of the main force of Polish infantry under Generał Śmigły on 21 April did the Poles gain the upper hand, attacking those parts of the town still held by the Red Army. The Polish infantry was able to reinforce the cavalry in the city center, and during the night, with help of local guides, Polish forces crossed the river and took one of the bridges. On April 20, the bridges were in the hands of the Poles, and more of the city fell under their control. During the afternoon of that day, after a three-day-long urban battle, the city was in Polish hands. Piłsudski arrived in Vilnius on the same day. There was a common belief among the Poles that most Jews were Bolsheviks and Communists, in league with the enemy of the Polish state, Soviet Russia. The Polish army stated that any Jews it killed were militants and collaborators engaged in actions against the Polish army. Having been fired at from Jewish homes, Polish soldiers took this as an excuse to break into many Jewish homes and stores, beating the Jews and robbing them, desecrating synagogues, arresting hundreds, depriving them of food and drink for days and deporting them from the city; such abuses were, however, not supported by – and even specifically forbidden by – the Polish high command. Near the end of the month about 12,000 infantry, 3,000 cavalry, 210 heavy machine guns and 44 guns were assembled by Soviet forces in the area of Szyrwiany, Podbrodzie, Soly and Ashmyany. Polish forces in the area under general Stanisław Szeptycki numbered 11,000; Rydz-Śmigly had 8 infantry battalions, 18 cavalry squadrons and 18 guns in Vilnius itself. Rydz-Śmigły decided to engage enemy forces before they combined their strengths. On the night of April 28–29, general Stefan Dąb-Biernacki took Podbrodzie, capturing one of the Soviet formations. Simultaneously, Soviet forces attacked near Deliny–Ogrodniki, south of Vilnius. Polish defenses and counterattacks managed to halt Soviet movements towards Vilnius, pushing them back towards Szkodziszki–Grygajce. In retaliation, Soviet forces launched yet another counterattack, this one from north of Vilnius. The results were significantly better than those of the previous offensive, with Soviet forces breaking through Polish defenses in the area. However, Red Army forces halted their movements short of Vilnius, not wishing to attack a hostile city during the night. Polish forces took advantage of the opportunity to strengthen their defenses. Shortly afterwards, Polish forces counterattacked, pushing the Red Army back towards Mejszagoła and Podberezie. Polish forces pursued and took those two settlements, as well as Giedrojsc and Smorgoń. By mid-May Polish forces had reached the line of Narocz lake – Hoduciszki – Ignalina – Lyngniany, leaving Vilnius well behind the frontline. Acting in accordance with his vision of a Polish-led "Międzymorze" federation of East-Central European states, Piłsudski on April 22, 1919, issued a bilingual statement, in Polish and Lithuanian, of his political intentions — the "Proclamation to the inhabitants of the former Grand Duchy of Lithuania", pledging to provide "elections [which will] take place on the basis of secret, universal and direct voting, without distinction between the sexes" and to "create an opportunity for settling your nationality problems and religious affairs in a manner that you yourself will determine, without any kind of force or pressure from Poland." Piłsudski's proclamation was aimed at showing good will both to Lithuanians and international diplomats; the latter succeeded as the proclamation dealt a blow to the image of 'Polish conquest' and replaced it with the image of 'Poland fighting with Bolsheviks dictatorship and liberating other nations'; however the Lithuanians who demanded exclusive control over the city were much less convinced. Piłsudski's words also caused significant controversy on the Polish political scene; as they had not been discussed with the Sejm and caused much anger among Piłsudski's National-Democratic opponents; Polish People's Party "Piast" deputies demanded incorporation of the Vilnius Region into Poland and even accused Piłsudski of treason. However, Piłsudski's supporters in the Polish Socialist Party managed to deflect those attacks. b ^ Speaking of Poland's frontiers Piłsudski said: "All that we can gain in the west depends on the Entente — on the extent to which it may wish to squeeze Germany", while in the east "there are doors that open and close, and it depends on who forces them open and how far." 1 2 3 4 Collection of Polish military comminiques, 1919–1921, "O niepodległą i granice", Wyższa Szkoła Humanistyczna, Pułtusk, 1999. Pages – 168-172.Part available online in this letter to Rzeczpospolita. ↑ MacMillan, Margaret, Paris 1919 : Six Months That Changed the World, Random House Trade Paperbacks, 2003, ISBN 0-375-76052-0, p. 213-214. ↑ Snyder, Timothy. Reconstruction of Nations : Poland, Ukraine, Lithuania, Belarus, 1569–1999. Yale University Press. p. 49. ISBN 0-300-09569-4. Jews had been generally sympathetic to the Lithuanian claim, believing that a large multinational Lithuania with Vilne as its capital would be more likely to respect their rights. Their reward in 1919 had been the first pogroms in modern Vilne. ↑ Michlic, Joanna Beata (2006). Poland's Threatening Other: The Image of the Jew from 1880 to the Present. University of Nebraska Press. pp. 117–118. ISBN 0-8032-3240-3. 1 2 3 4 Piotrowski, Tadeusz (1997). Poland's Holocaust: Ethnic Strife, Collaboration with Occupying Forces and Genocide... McFarland & Company. pp. 41–42. ISBN 0-7864-0371-3. ↑ Words to Outlive Us: Voices from the Warsaw Ghetto. Michał Grynberg, 2002. ↑ Margaret MacMillan, Paris 1919 : Six Months That Changed the World, Random House Trade Paperbacks, 2003, ISBN 0-375-76052-0, p.212"
Мельтюхов, Михаил Иванович (Mikhail Meltyukhov) (2001). Советско-польские войны. Военно-политическое противостояние 1918—1939 гг. (Soviet-Polish Wars. Political and Military standoff of 1918-1939) (in Russian). Moscow: Вече (Veche). ISBN 5-699-07637-9. LCCN 2002323889.